What are the different types of helices in protein secondary structures and how are they differentiated? 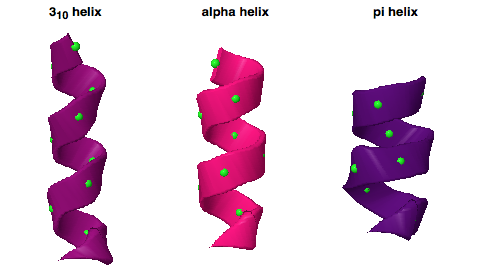 In the DSSP docs, types of helices mentioned are: Alpha-Helix, Helix-3, and Helix-5. In the STRIDE docs, types of helices mentioned are: Alpha-Helix, 3-10 Helix, PI-Helix. Why does DSSP have Helix-3 and Helix-5, while STRIDE has 3-10 Helix and PI-Helix - are they different expressions for the same thing? What are the differences between these types of helices, what are their full scientific names so that I could read more about them, and are there any other types of helices not mentioned here? The α-helix) is described in every biochemistry text book and widely on the web. It has 3.6 residues per helical turn and has 13 atoms in the ring formed by the hydrogen bond and so can also be called a 3.6-13 helix. The 3-10 helix is less common than the α-helix, but is still widespread. By analogy with the alternative nomenclature just described for the α-helix, it has 3 residues per helical turn in a 10 atom ring. The π-helix is less common. It is a wider helix with 4.6 residues per turn. A comparison of the three can be found in this proteopedia article, from which I have taken the illustration below. There is also the collagen triple-helix, but that is specific to that protein, whereas the others are general examples of secondary structure found in many proteins. There is no such thing as a “full scientific name” in this area of molecular biology. Names tend to get standardized by unofficial agreement when ambiguity becomes a problem. Helices other than the α-helix are not very well known, but the terms3-10 helix and π-helix are certainly more common than Helix-3 and Helix-5, which I suspect may have been a computational convenience. However, an internet search indicates that for scientific journals 310-helix is generally preferred to 3-10 helix or 3(10)-helix, these latter perhaps reflecting work in a plain text environment or the word-processing or HTML limitations of writers. Not the answer you're looking for? Browse other questions tagged molecular-biology proteins protein-structure protein-folding or ask your own question.